It's been a while since I last did lash extensions. A few weeks back, Carousell featured beauty services and I was surprised by the sheer number of home-based services available in Singapore! 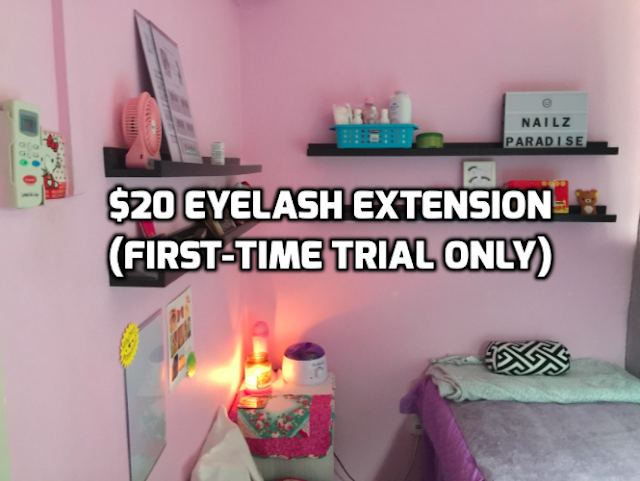 It was a spontaneous decision to try on lash extensions again :P. One of the eyelash extensions services was going for $20, and it was dirt-cheap because the average lash extension price would be at least a $100! I decided to google for reviews and there has been pretty good online feedback about the company (aka Nailzparadise). Read till the end how you can get a trial price of $20! Prior to the session, a full payment must be made in advance. I was initially confused because Prisicilla said that it's a $20 deposit — isn't a deposit a partial payment before the actual service is rendered? Anyway, I made the full payment hoping that nothing will go wrong. The service was rendered in a HDB flat in-between Pioneer and Boon Lay— i was 15 mins late for the session because the taxi driver couldn't find the labyrinth of blocks! Priscilla was quite friendly and welcoming — she ushered me to a beautiful cozy pink room. In the living room, I noticed that there was an area set aside for nail art. Priscilla says that nail art is her passion and she has just started doing lash extensions less than a year ago. Prior to the lash extensions, Priscilla gave an introduction about the lashes that she owns. According to her, all lashes were imported from Korea. She also allowed me to touch the lashes for softness and if I were to top-up $20, she would throw-in a eye mask as well as a special glue. I also had to top-up additional money for softer lashes as well. I decided to top-up but as I was lying down, she changed her mind and said that she'd give me "D-curls" instead. I asked her what's a d-curl and she said it's a different type of curl... and being a newbie to the world of eyelash extensions, I asked if the length would be longer. She said all lash extensions have the same length! Anyway, I decided not to talk anymore because I was afraid my eyelids would twitch or something. Nevertheless, I think it was quite a good experience with only $20! The session was comfortable as she played the radio in the background, and I'm pretty sure I fell asleep. However, since its a strand-by-strand application, the session took 2.5 hrs (I expected it to be an hour).